If you make French toast in the oven, is it still French toast? Or does baking it make it bread pudding? Is there a difference? Maybe it’s baked French toast if you leave it whole and bread pudding if you cut the bread into cubes? Sooooo many questions. Ultimately it doesn’t matter what you call it, but how it tastes. I love French toast. I don’t always love the dipping and flipping though because I’m lazy. I hate the drips that always end up on your stove top. I can never seem to get it from the egg mixture into the pan without spillage. The easy way out is to use your waffle iron and waffle your French toast, but I also have an even lazier way. I’ve done this before in several microwave variations and called it the World’s Easiest Bread Pudding. That makes it simple to take with you and even make it at work. It doesn’t give you a crispy top though. What to do when you want a crunchy, crispy top to your baked goodies? Bake it in the oven. 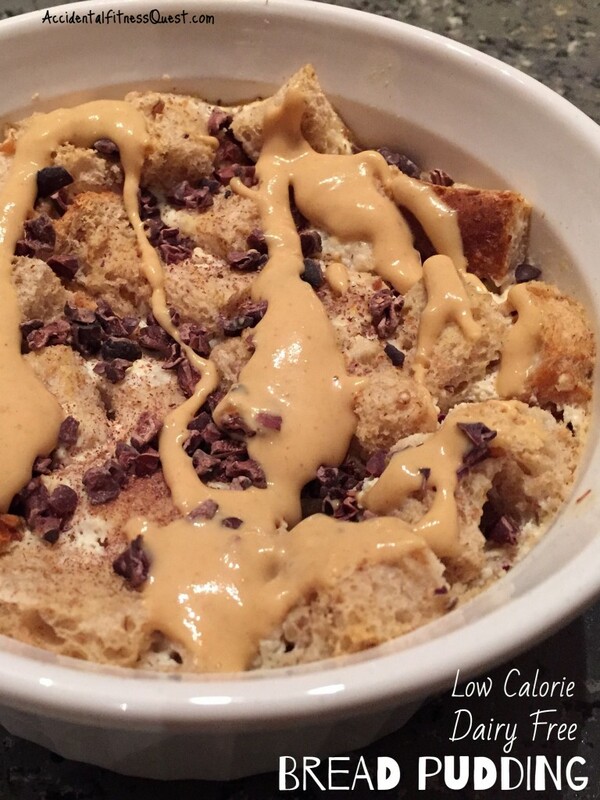 Because The Kid has a dairy allergy, I make my bread pudding dairy free and use almond milk. It just so happened last night that I was also out of eggs when the craving hit. I went to my back up plan and used tofu. Yep, you can bake with tofu in place of eggs. Trust me on this one. Preheat oven to 350 degrees and spray a small baking dish with non-stick spray. I used a 6 inch baking dish that’s about 3 inches deep. Mix the tofu and almond milk in a blender or Magic Bullet. Pulse and blend until smooth. Stir in the baking powder and vanilla extract. Pour the mixture into the baking dish. Cut the bread into cubes and press into the tofu mixture, making sure that the bread begins to absorb the liquid. Sprinkle the pinch of sugar over top. Bake at 350 degrees for about 20 minutes until cooked thoroughly and the top is browned. Remove from oven and top with toppings of choice. Makes one single serving at approximately 211 calories – 16g protein, 21g carbs, 7g fat (not including toppings). I topped mine with cacao nibs and a PB2 drizzle to make a chocolate peanut butter combo. That only added 52 calories – 6g protein, 6g carbs, 4g fat. Get crazy with the toppings and have fun with the flavor combinations. Fruit, berries, chocolate chips, coconut, and more.